COMMENT – There I was, all set to write a piece based on three articles that appeared in the same issue of the Daily Telegraph, when up popped my favourite little bête noire, Michael ‘Not listening if you don’t agree with me, got my fingers in my ears, la, la, la’ Gove with a pronouncement on the future of the National Curriculum. I say a “pronouncement” – what I really meant was the sort of frothing at the mouth, angry little venting of spleen which puts me in mind of a bloke with a little black ‘tache who wore a uniform and shouted a lot whilst waving his arms. He didn’t listen to people who disagreed with him, either, I recall. Michael Gove’s revamping of the National Curriculum appears to be based on two core features: things that he thinks children must not be allowed to get away without covering in school and things that he reckons they’re “entitled” to cover. You’ll notice that I used the word ‘cover’ rather than ‘study’ or even ‘learn’, because ever since the National Curriculum was first inflicted upon schools back in the late 80s, there’s been a lot of ‘covering’ but not all that much ‘learning’. That’s what happens when you start to base education on lists of things, rather than the development of learning and the skills you might hope to embed in children. Mikey was all annoyed because lots of people have so far pointed out that some of his other big ideas – principally the EBacc and its related new exams – are rubbish. That some of these people are those from whom he might have otherwise have hoped to draw support – like heads of ‘top’ independent schools, spokes-folk from Russell group universities – as well as hoi polloi from whom he’d expect carping criticism, like the teacher unions and the Labour party, has really, really upset the poor man. He entitled a speech to the Social Market Foundation “No Excellence, please – we’re Labour”, suggesting that the opposition voiced to his half-baked ideas were nothing more than attempts to prevent poor, working class urchins from becoming the Ruler of the Queen’s Navy. 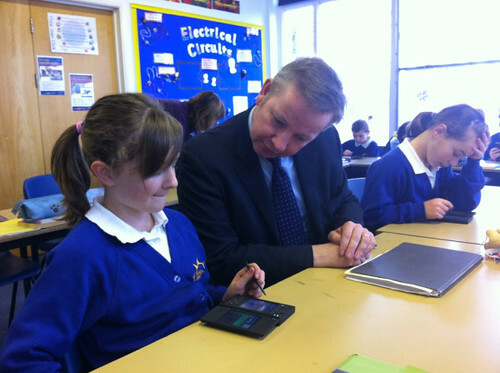 Gove believes that requiring all children to study the core Ebacc subjects, with harder, mug-it-all-up final exams rather than namby-pamby coursework, is the way to get Britain economically successful and – presumably – pinkly straddling the world as we did in the days of the Empire. He went on to suggest that the reason there is a direct pathway from the top independent schools, a pathway he described as “medieval cloisters” which “connect seamlessly to the corridors of power” is because they teach a curriculum like what he intends to impose on those state schools which are not now academies. It occurred to me at this point that if there were a gold medal for hitting the right nail on the head with the wrong hammer, Gove would be on the podium, waving and crying by now – because whilst I couldn’t agree more with him about that “seamless” connection from the top public schools to the corridors of power, it’s not remotely down to the teaching of pre-twentieth century literature, oxbow lakes and the kings and queens of England. In fact, they could teach anything they wanted to at Eton (though it’s amusing to remember that they’ve been teaching GCSEs and A levels like everyone else) – they could enter all the boys for Brownie badges in home-making and semaphore – and the young people who emerge from their lovely cloisters would still make a bee-line for the corridors of power. This is because where and to whom you are born, plus how and by whom you are brought up, trump any amount of book-learning. Gove claimed in his speech that the EBacc subjects were “the most liberating of all options in school” and I have to admit that I gave a little involuntary honk of laughter when I read on that this was because they are a “precondition for entry to many universities.” It’s that old ‘sledgehammer to crack a nut’ approach to curriculum design that was first employed by one of Gove’s predecessors as Tory education secretary, Kenneth Baker. It’s ironic (and Gove cannot see the irony) that we have once again a Conservative education secretary trying to persuade us that making every, single child study the self-same subjects is the way to get more of them into Russell group universities – when he believes from the very depths of his soul that too many students are taking degrees anyway. At a time when the economy is slumping desperately in its attempts to drag itself out from the swamp caused by emergent, tiger economies, the secretary of state for education wants to revise the curriculum so that children get an old-fashioned education, containing more liberal arts and less technology. In other words, we’ll all find it harder and harder to find a plumber, a joiner or even someone to polish up the knocker on the big front door, but they’ll be able to recite poetry by heart and tell you who the king was in 1493. Or, more likely, they won’t be able to do either. I haven’t even mentioned Gove’s reference to eradicating from the curriculum what he called “vapid happy talk”, but then, I’m still trying to find someone who has the remotest idea what he was on about. If anyone out there has any ideas – please post them under this article. You can imagine how thrilled I was, therefore, to discover that the afore-mentioned Kenneth Baker was giving interviews of his own last week, largely (or perhaps entirely) because he was hawking a book called “14-18: A Vision for Secondary Education.” In it – and those of a fainty disposition ought to sit down right now – Baker outlines his belief that children ought to be in primary school until age nine, then middle school and following assessment at 14, they should go to a specialist school most suitable for them. Baker thinks that from 14-18, the national curriculum should end and instead one of four pathways should be taken in technical, academic, arts and sports or what he describes as a “career course”, where they would specialise in such things as plumbing or catering. You need to recall that Baker imposed the National Curriculum on all English schools in 1988, which is almost 25 years ago. Whilst this amount of time might be like unto a mere evening gone for Lord Ken, it suggests to me that imposing a curriculum – which he now clearly believes was entirely wrong – on many thousands of children indicates strongly that career politicians shouldn’t actually be allowed to mess with such things. Which brings me back to the current Messer of State for Education and his own, particular brand of messing. Gove presents himself as a kind of crusader on behalf of the downtrodden masses who, previously denied Shelley, Austen and Moliere, will find their life chances miraculously transformed via access to the kind of ‘classical’ curriculum he enjoyed at his independent school. If he’d gone on to say that his aim was to eradicate the working class and make everyone middle class, I wouldn’t have been a bit surprised. I must admit at this point that you could have called me Queen Gobsmacked of the Extremely Stunned People when, only hours after putting this article to bed, I heard on the news that Gove had done a U turn of massive proportions and decided not, after all, to ditch GCSEs for his exams in memory of days of Yore, the English Baccalaureate Certificate. The only way I could actually imagine how this happened was to picture Cameron, Osborne and various other Tories sitting on top of Gove and refusing to get off until he agreed to ditch his insane proposal. Gove is probably in a corner sucking his thumb as I write, possibly under what we call in my part of the North the “mardy blanket”. I do hope so.